Technology — TerraCraft Motors Inc. The ILCS is an exclusive TerraCraft Motors Inc., patented technology. The system is a bionic, electromechanical system that can either sense human leaning movements and motions while comparing it with multiple electronic sensing and kinematic systems, or alternatively the bionic controls can be turned off for fully automatic ILCS lean control (The Copilot). The ILCS is the solution to an 80+ year old challenge of how to actively control a counter – steering, leaning trike at performance speeds that combines human space-rated safety system designs and an intuitive, motorcycle-purist, lean control approach for faster cornering in a stable platform. The ILCS system, coupled with independent steering and high performance hardware options, make the TerraCraft the extreme exotic super-trike that rides like a bike. Physics tamed! Our CoPilot technology is the “control” aspect of the patented TerraCraft Interactive Lean Control System (ILCS). The CoPilot utilizes a proprietary network of sensors, sophisticated software that senses and counters all forces acting on the supertrike using an intelligent controller to lean into turns exactly as an experienced rider would lean a traditional, two-wheeled motorcycle. By creating an ‘expert rider model’ in the software, the CoPilot system is able to adapt to all road forces and conditions then respond in a fraction of the time, and much more precisely, than a human rider is capable of. Manual controls still allow the more experienced rider to anticipate events and enjoy true counter-steering and steer-by-leaning exactly as on a motorcycle, while the autonomous CoPilot produces an unprecedented safety and performance envelope. In addition to providing automatic center of gravity inputs for the calculation of the optimal tilt angle, CoPilot sensors provide information on magnetic heading, road incline and banking, road surface smoothness, engine vibration, skid and hydroplaning, and aerodynamic effects such as wind gusting. The CoPilot offsets centrifugal forces and other environmental conditions to more safely operate the vehicle and allow for, stable, higher performance operation. TerraCraft Motors Inc. developed our super-trike technology in our in-house technology laboratory. 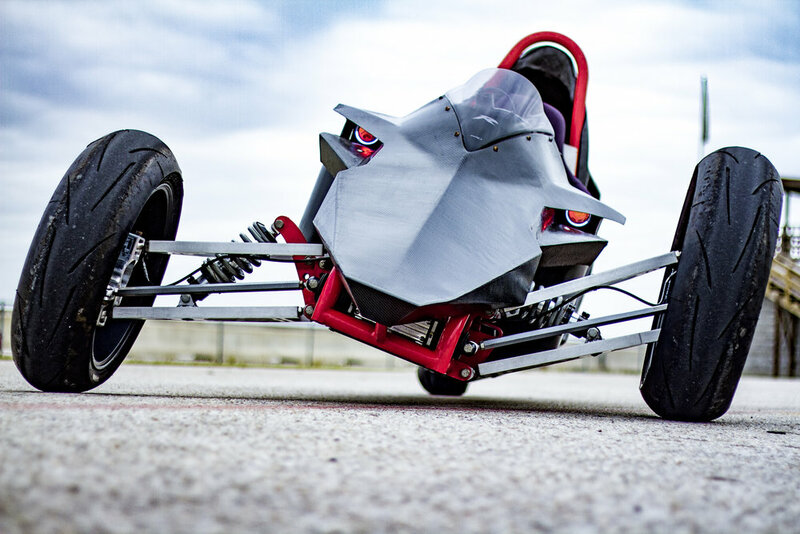 Super-trikes are only the beginning. We have a research and development team and facilities to enable motorsport technology applications for a wide spectrum of customers. TerraCraft has also identified other yet to be explored potential applications of our technologies throughout industry. Contact us to discuss possible investment opportunities. TerraCraft will consider partnerships with strategic investors who are aligned with our vision. TerraCraft Motors Inc. is open to licensing discussions regarding our Interactive Lean Control System (ILCS) technology with industry original equipment manufacturers for commercialization opportunities. Our discussions could include major OEMs offering capital investment to exclusively partner for development our ILCS technology for mass-market vehicles. Other ideas? Contact us to discuss your ideas.